And I mean that in the best way possible. 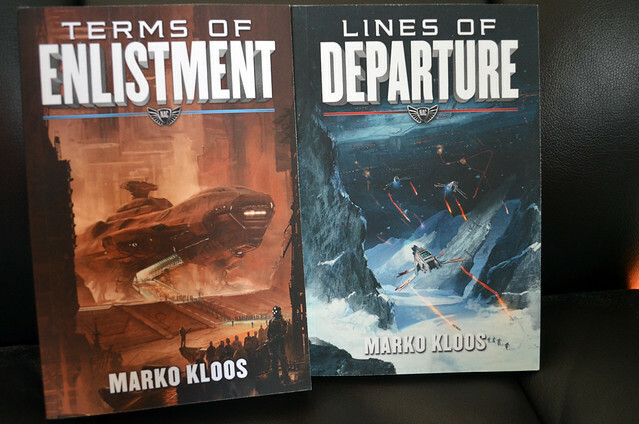 Marko Kloos, the author, was a student of mine at Viable Paradise a few years ago, and among other things I did there, I critiqued part of what would become Terms of Enlistment. Marko finished it up and released it first as a self-pubbed book and then through 47 North, which also picked up the sequel, Lines of Departure. I believe a third book is on the way, too. Can’t tell you how cool it is when someone you taught goes on and publishes. I taught three years at VP and a year at Clarion, and each of those classes were filled with writers who were smart as hell and genuinely fine wordsmiths. Several have gone on to publish — and I’m absolutely delighted each time it happens. One cannot take too much credit for other people’s work (and besides there were several other very excellent instructors both at VP and Clarion), but one can still feel pride in their accomplishments. Marko and all the other alumni I had the honor of teaching at VP and Clarion are one reason I don’t worry too much about the future of science fiction and fantasy. Smart and talented people continue to come in the field. They write excellent work. It sells and gets talked about. And the process continues. As a reader and a fan of the genre, that makes me very happy. Incidentally, this is an excellent place for me to you let you know that both Viable Paradise and Clarion are accepting applications for students for this year. Clarion is excellent if you have six weeks to devote to workshopping; VP is where you want to go if you can spare a week. Both are wholly worth your time. Click on those links to go to the Web page of each.